This is an easy recipe to make in advance, then just pop in the oven when you want to eat it. The veggies make it healthier than a normal lasagna, plus add great flavor! Now is the perfect time to get delicious, in season zucchini and eggplant for your meal. Cook the lasagna noodles according to the package directions. Spread a light layer of marinara sauce across a 8x11 casserole dish, then layer with noodles, marinara sauce, cheese and zucchini. Repeat with a layer of eggplant, then top with cheese. Sprinkle with garlic powder, pepper and oregano. Cover with foil and bake at 375F until cooked through (about 30 minutes). This looks so delicious! I want to try this asap! I love vegetable lasagna! I make an eggplant lasagna sans the noodles and it’s also good! What a great meal to showcase fall vegetables! Happy Cooking! Yummy, yummy! Always looking for veggie friendly recipes. Thanks for this one! Eggplant parmesan is one of my favorite dishes, so this is SO meant for me. Yummy! Eggplant parm is my favorite. Adding zucchini is such a perfect addition!! Zucchini is my latest obsession and eggplant is my all-the-time obsession! Putting them together in one delicious lasagna just makes perfect sense! Anything that has tomato sauce, pasta and cheese is a winner in my book! Adding the veggies would make me feel like I could eat tons without feeling guilty! Oh my this would make a great Lent meal. It probably freezes well also. Thanks for sharing. Yummy! I love veggie lasagnas like this! 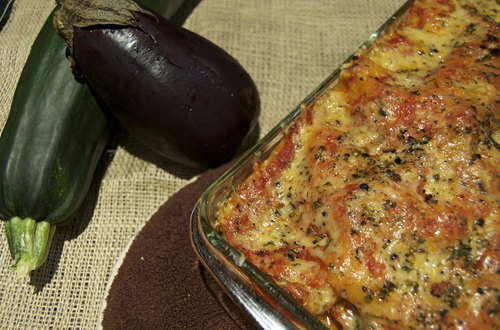 And eggplant always works so well in baked Italian dishes like this! That looks so good. I wish I could actually say we had a hot summer but it’s been autumn since june here (or it feels that way at least) but nevertheless… autumn is always a fun season or so I think. 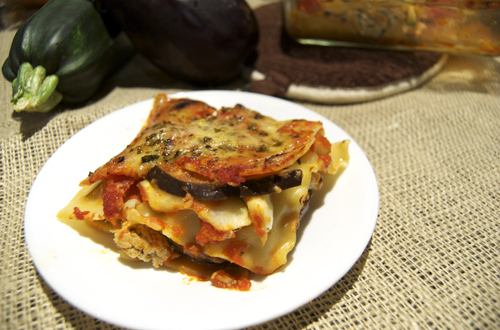 This zucchini and eggplant lasagne looks like a perfect autumn dish to me! Thanks for visiting my blog! MMMMM–This looks great. Can you use the “no boil” lasagna for this recipe? Wow that cheese layer looks incredible! Love veggie lasagna! This looks like my kind of lasagna!!! Love all the veggies! I am in! This looks great. I love eggplant and zucchini. What a great way to make lasagna that much healthier. I seriously canNOT WAIT to get home and make this! I was gonna just add zucchini to an eggplant parm recipe but have been wanting to make vegetable lasagna, so, well this sounds perfect. I am officially gushing. Thanks for the post!